You can build virtually anything in Minecraft, so why not use that ability to create impressive structures? Check out the following steps you need to take to build exciting and creative structures. The first step to building a large-scale build is figuring out exactly what it is that you want to create. First, focus on the purpose of the building. How do you want to use it? Is it only for decoration, or does it have a function? If your building has a specific function, think more about what you need to build or place inside and out. Where you decide to build contributes to your building’s look. 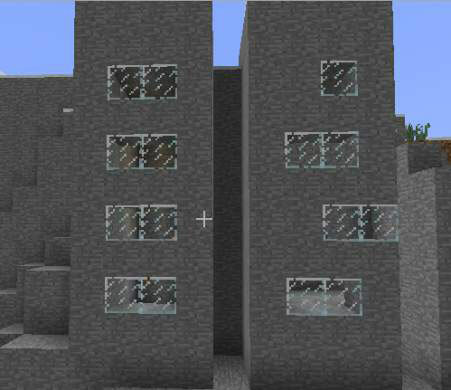 For example, are the surrounding buildings square, or are they rounded? If all other structures are square, yours should be square, too. Choosing blocks is simple: Just refer to your original plans and pick the type of block that matches the idea. For example, if you want your building to look ancient or abandoned, use cracked blocks that look like cracked stone bricks. If you created the building with a specific theme, pick the color of the blocks based on that theme. As always, the new structure should blend in with its surroundings. To set up the area, you first need to find an area. Where do you want to be? On the beach? In the woods? In a city? As you clear the area, look to see whether you can spot any water or lava near you. If you do, find out where it’s coming from, and try to stop the flow. The only reason that water might be helpful to you is if you want to build a farm. Always ensure that your surroundings are safe. The central room is the first room you enter, and you build all other rooms around it. First plan out the central room. Though this step may seem boring, don’t skip it! To determine the size of the central room, look at its original plans. How big are the other rooms supposed to be? How much room does that leave for your central room? Any time you build, start with a wireframe because it’s easy to tear down or change. 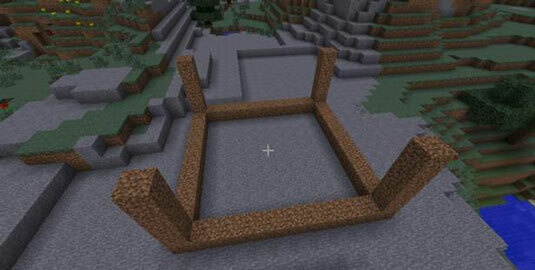 To build a wire frame, place the blocks on both sides for the length of the room, and then the width, so that you have a square. Next, make pillars in each corner of the wireframe base. However high you make the pillar is how tall the room will be. Finally, connect the top of the pillars to finish the wireframe for your room. Did you notice anything odd about the wireframe of the room? It has six holes: one above you, one below you, and four around you. 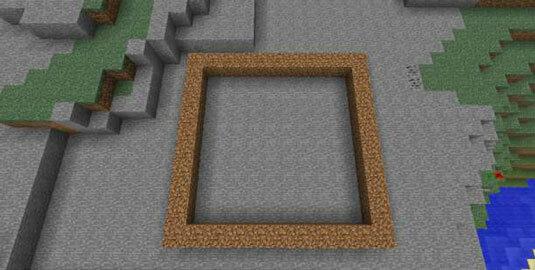 Go ahead and fill in the holes with the block you want to build with. 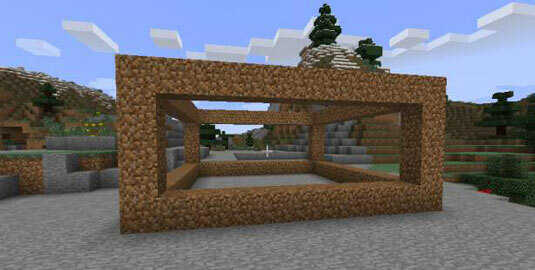 After you build the central room, you can wireframe the rest of your structure. Look at the original plans, and use wireframing blocks to make an outline of the rest of your build. Keep checking your plans so that you don’t become confused or make a mistake. To fill in the wireframe, place blocks inside it until it’s full. To place a block, right-click. When the wireframe is filled, you end up with a wall. Keep filling in the wireframe until the outside of the structure is finished. Remember the ceiling and the floor! To make these items, fill in the top and bottom of the wireframe. If you have a theme in mind for your building or a specific purpose for it, start by adding items that fit your intentions. 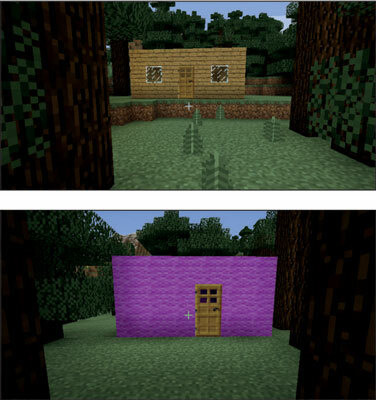 For example, if you built a house to live in, it needs some basic items, such as a furnace and a crafting table. A house also needs light. A torch is a helpful light source. Glowstone not only looks good but also gives off a good amount of light. You can use redstone lamps, too. Or you can go with windows or a glass ceiling for natural light. Now it’s time to pay attention to the details. Elements such as trim, decorated doorways, and 3D designs can add pizazz to your build. Trim makes the colors in your house stand out and helps your house look more three-dimensional. Trim is all about the color of the blocks. Pick trim colors that complement each other. You can make the doorway stand out by adding some trim. The idea is to make sure that the door doesn’t simply blend in with the wall. Go outside and look at your building. If you see something you want to change, whether it’s a major revision or a small tweak, go ahead and change it. Be sure to look at your windows to see whether they match. Are they the same height? Are they the same number of blocks from each other? 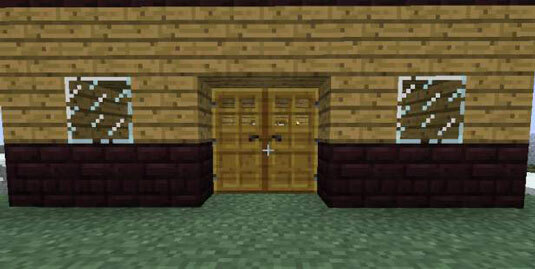 Another detail to examine is the door. You can make a bigger door by adding another door beside your first one. When you do, the handles turn toward each other on their own. When you’re happy with the exterior details, take a look inside to see whether you want to change anything. One element that players sometimes want to change is the flooring. You can use just about anything for the floor. Congratulations! You’re pretty much finished with your building. Now you have only one last step to complete and that’s to never stop making your building better.